"And what happens when PR turns a profit, and truth goes penniless?" "Insanity is doing the same thing, over and over again, and expecting different results." for Iron Man to spread fear." Most Americans are completely unaware of FIFA or what it does, and only a bit more aware of the World Cup and non-US football. Unless they are school age children perhaps, the parents of same, or recent immigrants from Europe and South America. The official reason for the US to proceed with prosecutions of FIFA this week, after a 24 year investigation, is that the payoff schemes involved some of the Wall Street Banks. Since it is unlikely that there will be any action against these same Banks, one wonders as to the reason and the timing for this. This week FIFA was expected to sanction Israel on Wednesday for their truly terrible treatment of Palestinian football clubs. And the US was perturbed that Qatar was chosen as the 2022 World Cup host, despite their awful human rights record, and record donations to the Clinton Fund, and loyalty to the US ambitions in the Mideast. And finally, FIFA dared to award the 2018 World Cup to Moscow. Have you noticed that this FIFA prosecution, which so few understand and care about in the States, is getting so much more media coverage than the latest massive thefts by the Banks in wholesale rigging in the forex markets, for which no one is being prosecuted and no serious reforms are being undertaken? There are risks in standing in any way against the will of an empire. And besides, FIFA is THEIR scandal, and it serves to distract from OUR scandals. Speaking of gold, it appears that Austria has decided that the risks of storing its sovereign gold in London are too great, and are repatriating it home. As well they may, because in the times that are just ahead, we might suspect that possession will be nine-tenths of the law, MF Global-style. 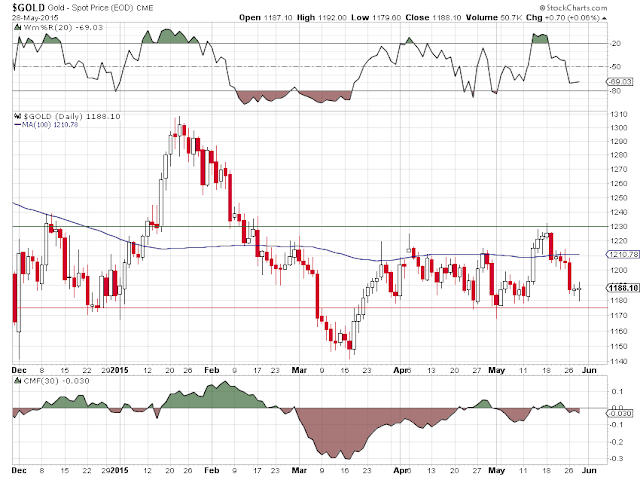 Gold and silver are quite obviously in some sort of locked down trading range. Gold will become much more interesting next week as June is an active month, and the leverage on the deliverable portion of the Comex gold warehouses is historically rather high, indicating higher prices ahead. Of course, that is not the way things work necessarily in The Bucket Shop on the Hudson. The gold game in the US benefits The Central Bank storytelling, and the Banks, who 'make markets,' or make-up markets to suit themselves and their trading profits. It is quite lucrative as we have seen in so many other cases like is such as LIBOR, forex, derivatives, and so forth. On a final note, it must seem like madness to the non-US observers, what the Fed is doing with QE and top down stimulus. Well not to the Brits, because they have taken such madness to heart, or the Continent, which is visiting senseless misery now on Greece, and a number of the usual suspects yet to come, until they finally make they way around to the volks at home. And so here we are, running off the rails on the neo-con and neo-liberal crazy train.